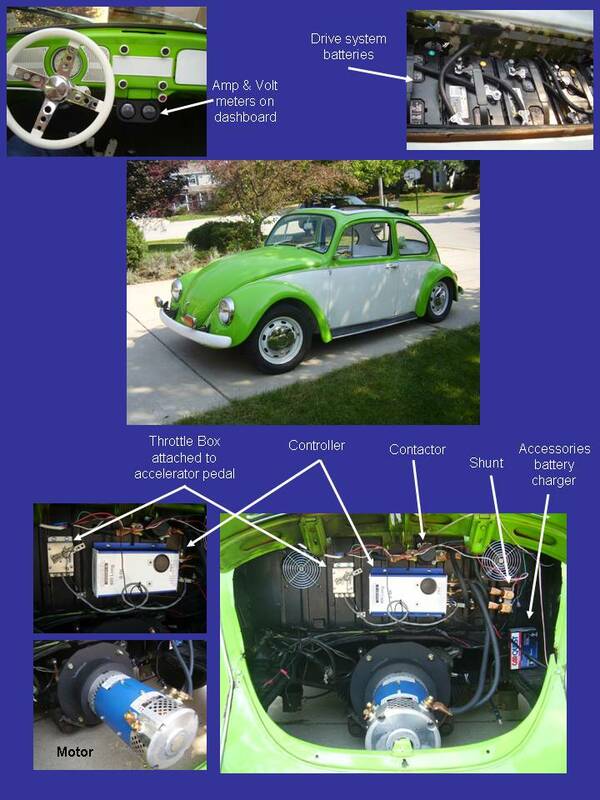 The first project was funded/completed by Professor Michael Kane and involves a 1973 VW Bug. The VW cost was $1,500 (without the engine) and had already been renovated (interior and exterior, looks great!). The conversion involved adding a 12-hp* DC motor to the existing VW transmission, as well as a dedicated potentiometer (i.e. throttle box), controller, contactor, shunt, and batteries (deep-cycle marine/RV batteries). The batteries cost $600, and the motor and controlling electronics cost $2,400. Note that the design of this EV was aimed at a "low cost" conversion rather than "high performance", and there are many different components and configurations that allow you to best balance cost-to-performance.